Session 1: Full Course Yellow, skill drills: Slalom course, and a threshold braking J-turn. Each drill was setup with cones on one straight. Session 2: Full Course yellow, drive the line (slow, no passing). Session 3: Full Course Green, Instructor ride-along (3 laps), student drive remaining time. Sessions 4,5,6: Full-course green. Student drive. What a way to start the journey! At 2000 lbs, and 220HP this guy moves around the track. 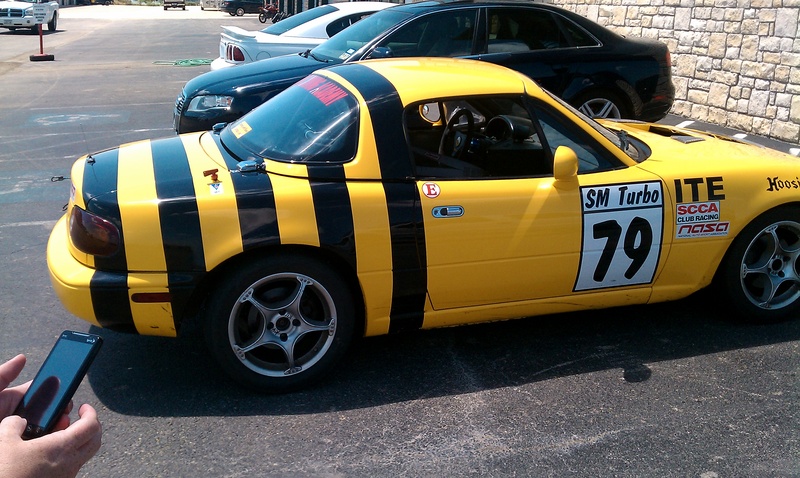 That’s 100+HP more than a standard Spec Miata race car. This is one of the standard cars in the Apex stable, so if you go out there…it is very fun. Session 1: Not much to say about this. We drove the loop about 6 times. Never did lockup the brakes on the J-turn, but since I’d been warned that if I flat-spotted the tires I owned them…I wasn’t eager to go over the limit in the brake test. 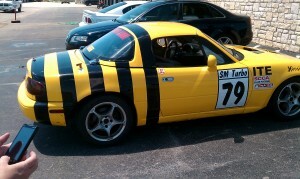 Session 2: My instructor is a current Spec Miata race driver. That was good because we could discuss Spec Miata specifics, and he was familiar with driving these tiny wheelbase, low, light cars. In this session he showed me the driving line. Even though it was technically full-course yellow, he had me driving pretty quick…we caught quite a few cars, and had to pull into the pits to get some space. Session 3: First green session. In class we discussed passing etiquette. Only on the long straights, after signal from driver in front. Also, only two cars can pass the same car at a time. The instructor drove the first three laps. Man the car has some grip! Since it was the first time “at speed” it was good to feel what the car was capable of. It was hard to focus on the line he was driving during the first lap. After the excitement of the first lap, it was time to settle down and pay attention! Next it was my turn to drive. I was pretty tentative during the first session. Braking early, turning in too early, not getting on the accelerator soon (or hard) enough. This was my first time ever driving a miata or anything with such a short wheel-base. In addition, I was driving someone else’s car, and responsible for all damages. Anyway, I drove about 6 or 7 laps. The car with all that power was super fast. Session 4: This session was interesting. I was feeling a little more confident. Trying to keep the ego in check, but my instructor was adamant that I get the accelerator down well before apex. By the third lap I was pretty comfortable with the line, and was catching quite a few cars. I caught a car going into Big Bend….a porsche boxter. There was a passing zone between big bend and tombstone, so my instructor said to stay right on him. As we came out of big bend, he pointed me inside so I mashed the accelerator and passed him by. Back to track left for entry into tombstone. By then, it was pretty late into the braking zone. I broke hard, but didn’t drop the speed quite as far as I was comfortable. So, I trailed the brake on into turn-in. This was NOT a good idea. The car felt very unstable, and immediately begin to come loose. The instructor tried to say “gas-gas-gas”…but, too late. Besides, my instincts said that didn’t sound like a good idea. So, we went through the apex looking at it through the windshield. The car continued on around, and my instructor said two feet in. After that I got a nice view of the Boxter I’d just passed…again, out the windshield. Finally, we came to a stop inside the driving line facing mostly forward. Whew! Okay…a couple deep, slow, breaths. Back in gear, get moving. We took it easy heaing back around the track. We needed to get the car checked in the pits. As we drove around we discussed the spin. Two mistakes: 1. braking too deep, and trying to trail into turn-in. 2. NOT hitting the gas once the rear started to come loose. Once we got back to the pits the car was checked out, and cleared to return to the track. Once we got back on the track, I really didn’t get much chance to get back into the groove. Tombstone is the second corner! So, right back at it. Tombstone / boothill was fine. But, I caught a car going into horseshoe. I didn’t have any choice but to apply some brake in the corner. I could feel the rear end loosen, so I gave it some gas and it settled down. I eased out of the throttle and was able to stay behind the car in front. I got several more opportunities to experience this phenomenon (throttle settling the tail down). Session 5 & 6: Both of these session were pretty uneventful. By this point I was feeling pretty comfortable with the line, and was able to begin to look down track a little more. it was about 3/4 through the session before I missed an apex. My instructor said, “It’s about time you missed one!” I was passing a lot of cars. Those poor GT-500 mustangs! In the classes my fellow students were asking what “I” had in that thing. In session 5, I started downshifting (3-2) in the middle of rattlesnake. My first experience with how busy that can make the cockpit. I didn’t know how to heel-toe, so I had to be in a place to let off the brake to blip the throttle. This works in the CW direction (but, not in CCW…you have to heel-toe going the other way). Summary: In all, the day was an absolute blast! I got to drive a COOL car. I got to drive a cool car, FAST. I got to SPIN a cool car. And I started the journey to driving wheel-2-wheel.